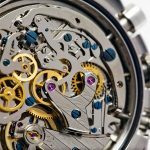 SIHH 2019 is right around the corner, otherwise known as Salon International de la Haute Horlogerie Geneve. It will take place from January 14 till the 17th. This is the event where brands such as Audemars Piguet, Cartier, Panerai, Ulysse Nardin, Jaeger-LeCoultre, Piaget, Vacheron Constantin, and many other brands unveil their novelty items for the year. As a leadup to the show, some of the brands have released previews to give us a sample of what we can expect this year. Below we take a look at four of such of these timepieces that will be showcased at the show. This soon-to-be released Cartier Tonneau Large Model watch will sport a 16mm x 12.9mm barrel-shaped case that is available in either platinum or pink gold. 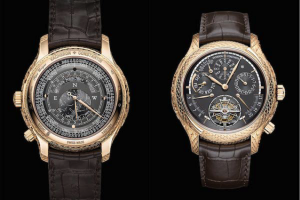 The pink gold variant will house a champagne dial while the platinum variant will include a silver dial and the platinum variant is also limited to only 100 pieces. 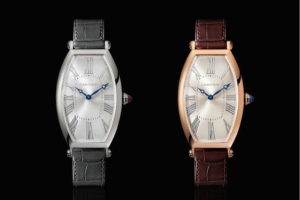 Cartier has fitted each of these new watches with signature design details from Roman numerals on the dial to the railroad minute track to the blue cabochon-cut sapphire on the winding crown. The timepiece is powered by a Caliber 1917 MC with a power reserve of 38 hours. Panerai has a rich and long history with diving and was also the official supplier of military dive watches for the Royal Italian Navy during the early part of the 20thcentury. 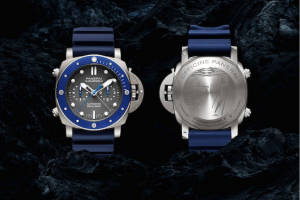 Now, in collaboration with French freediving champion, Guillaume Néry, Panerai announced a new Submersible as their 2019 release. The Panerai Submersible Chrono Guillaume Néry Edition (PAM00982) sports a massive 47 mm case in brushed titanium topped with a titanium and blue ceramic unidirectional rotating bezel. As a dive watch, the PAM00982 can safely dive down to 300 meters deep while the shark gray dial with luminous hour markers and hands offers plenty of legibility under water. Also, as a flyback chronograph, there is the duo of sub dials on the dial. along with the central chronograph hand. 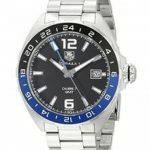 There’s also the matching dark blue accordion rubber strap with a titanium buckle. Running on the in-house P.9100 automatic movement, the Panerai Submersible Chrono Guillaume Néry Edition boasts a power reserve of 3 days thanks to two barrels. Audemars Piguet made big news earlier in 2018 when they announced that 2019 would be the last year that they will participate in SIHH. As a pre-game glimpse, Audemars Piguet announced a trio of new Royal Oak Offshore Chronograph Camouflage models. Available in blue, green, or brown, the new 2019 Royal Oak Offshore Chronograph Camouflage watches come equipped with large 44 mm cases fitted with the signature octagonal bezels, but in matching colored ceramic. The brown version is constructed with a pink gold case while the other two hues include steel cases. The dial includes the familiar “Méga-Tapisserie” pattern, also in either of the three shades, and the rubber camo style straps are where the watches earn their name. However, for those days that you don’t want to wear camouflage, each watch comes with a solid color strap too. At the heart of the new ROO chronographs is the Caliber 3126/3840 automatic movement with 50 hours of power reserve. Within Vacheron Constantinis a special department called “Le Cabinotiers,” which is in charge of producing ultra-complicated or bespoke timepieces. Just ahead of SIHH 2019, Vacheron Constantin announced the one-of-a-kind Les Cabinotiers Grande Complication Phoenix model with twin dials, 15 complications, and an intricately hand-engraved pink gold case displaying the mythical Phoenix.